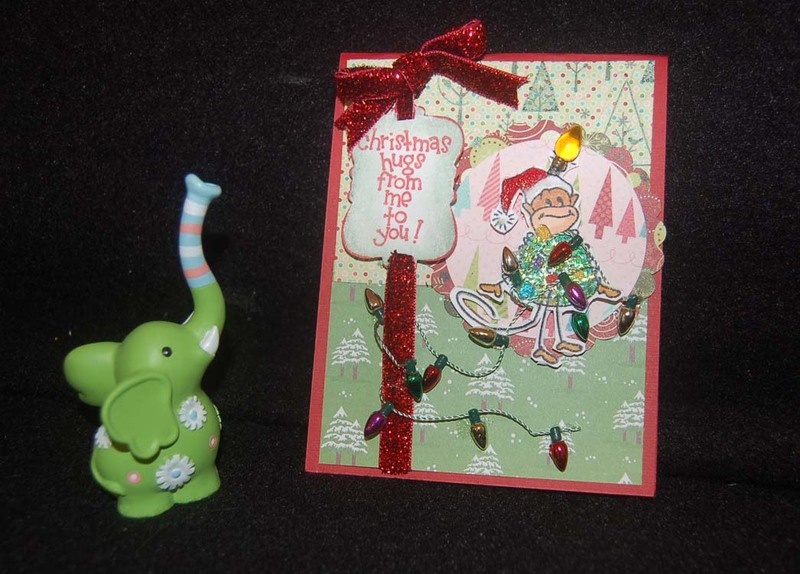 I think this is one of my favorite handmade cards of the season so I am sending it to all of you via this blog. It's a simple card with the main feature being the Doodlebug Designs twine strung EK Success border punched ornaments made from silver glittered card stock. The printed paper is made by American Crafts and the words are stamped from a Hero Arts set. Everything used on this card was purchased from Ben Franklin Crafts. If it's too late for you to be crafting for this Xmas, you can start buying for next year. LOL! I'm sure that BFC will have lots of after Christmas items for you to stock up on .......one year in advance. 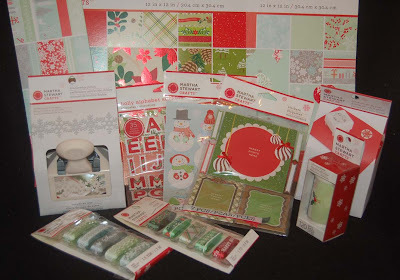 Let's all start crafting for Xmas early in 2012. 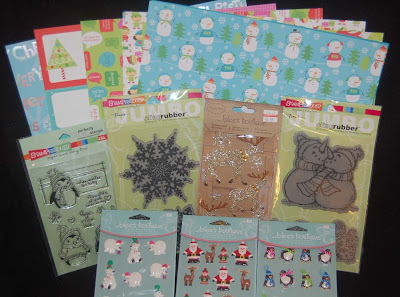 Thank you to everyone in blogland who visited my blog this year and supported our Hawaii based Ben Franklin Crafts store. We appreciate all of you and pledge to bring you the best craft products and services in the new year. Mahalo! 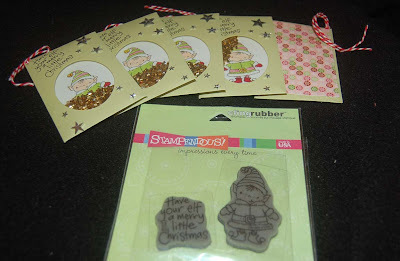 The Stampendous monkey cling stamp was purchased at the beginning of the holiday season and I've only now made use of it. Well, at least I have a template for my next year's Christmas cards. The holidays will be here again before you know it so it's nice to know I have a plan started. On this card I again used one of the new Hero Arts/Sizzix stamping embossing sets. The red and green dotted paper started out ho-hum, but once it was stamped and embossed with trees, it became ho-ho-ho holiday. 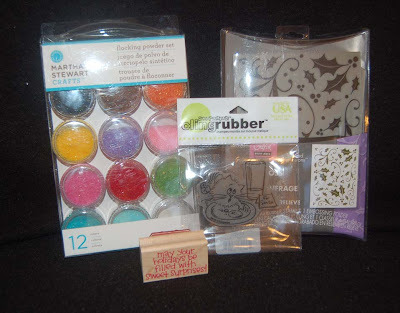 I used the new Sizzix die (from a set) without the word rubber stamp to cut the label shape. There are lots of useful printed sayings that go with the die shapes in this set. 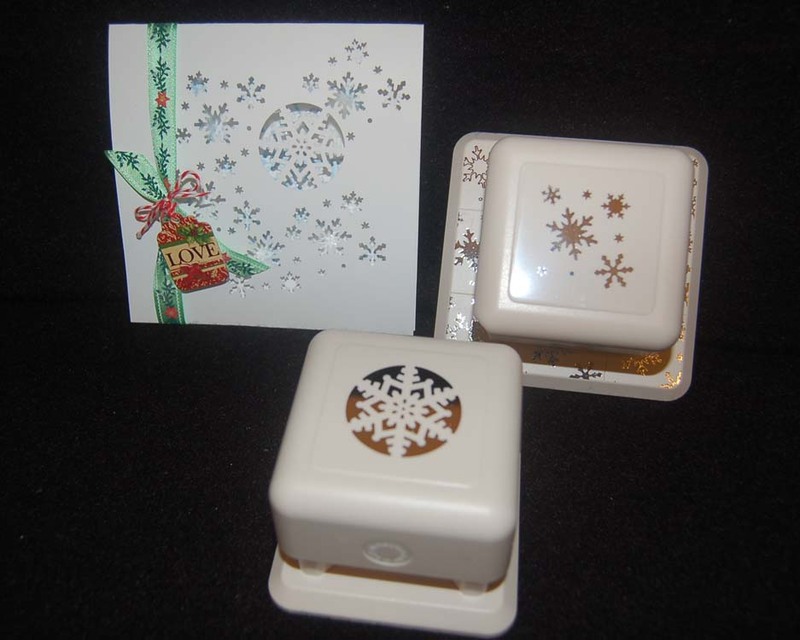 I chose to stamp a Dandelion Design Christmas stamp inside the label. To embellish the image of the really cute monkey wrapped up in Christmas lights, I used Martha Stewart glitter glue. 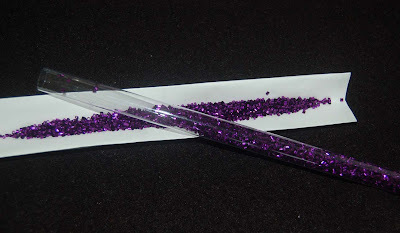 These MS glitter glues work as well as the Stickles and they come in a whole compact set. (It would make a terrific Christmas gift!) 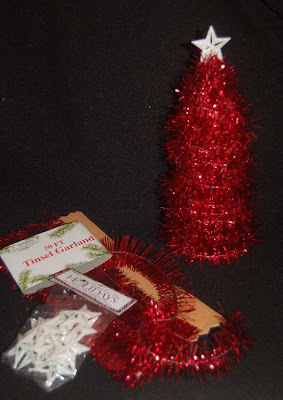 To give a sparkly evergreen look to the tree I added MS limeade tinsel glitter. The light bulbs were from the Christmas miniature section of the Ben Franklin Crafts store. Here are a more last-minute Christmas gift ideas. Who doesn't need and love pens? 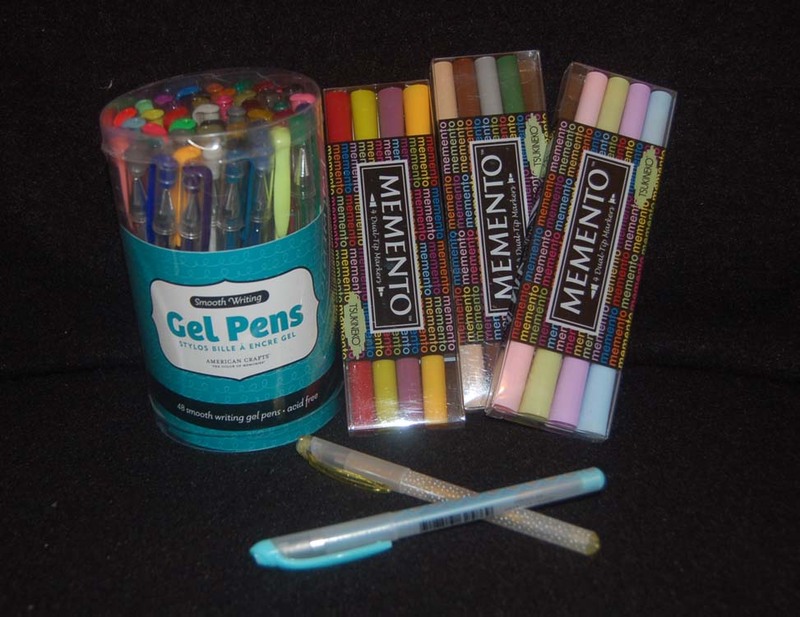 This jumbo set of colorful gel pens (48) is just $19.99 which is less than 42 cents for each pen! Crafters who make notepad sets will find this very economical and a bundle of pens is a great addition to any teacher/coach/office worker gift. The Memento pen sets have pretty assortments and the wonderful Tsukineko technology. Santa, please bring me all the sets because I couldn't choose just one. 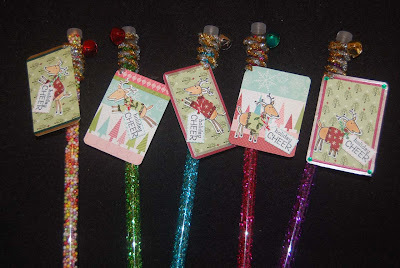 I also wanted to show you the candy shop gel pens (American Crafts) available singly in mouthwatering colors (some with sparkles) that you should choose for your own stocking stuffers. Yup, if you hurry you can still pick up some wonderful gifts at Ben Franklin Crafts and be sure to check out the special sales on selected Christmas items. There are some really terrific bargains so why not stock up for next year? I'll beat you to them if you don't hurry. LOL! It seems like ages ago that I bought the humorous Stampendous cat stamp but it was really only this November. I love the image but it took me over a month to come up with a card design that I liked. 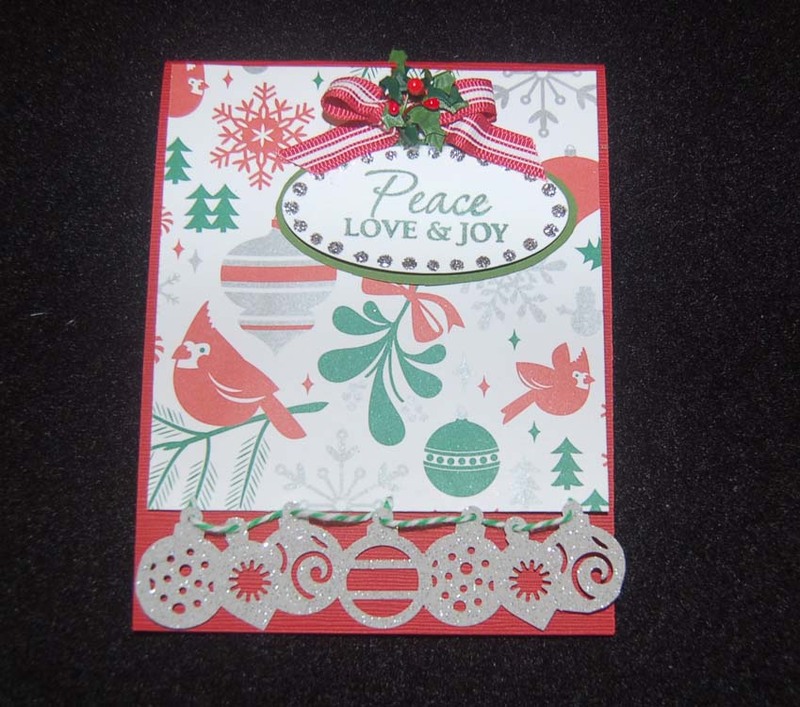 The new Hero Arts/Sizzix stamp and emboss holly set made it possible to change a plain red and white striped paper into a double embossed fancy background. I say double embossed because the holly leaves were first stamped in green pigment ink and then sprinkled with green embossing powder and heated with a heat gun. Next the embossed paper was embossed again in the embossing folder (from the set) run through a Sizzix Big Shot machine. Although the texture of the striped paper with holly leaves does not show up well in the photo, I do think it adds an interesting feature. 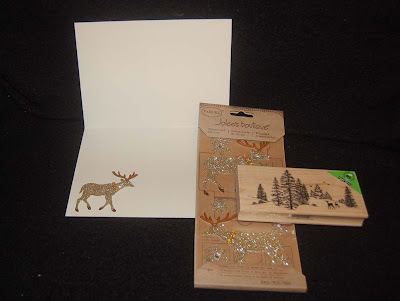 The other new item I tried on this card was the Martha Stewart sparkle flocking. I used white sparkle flocking on the cat and I think it really makes it pop and feel soft too. 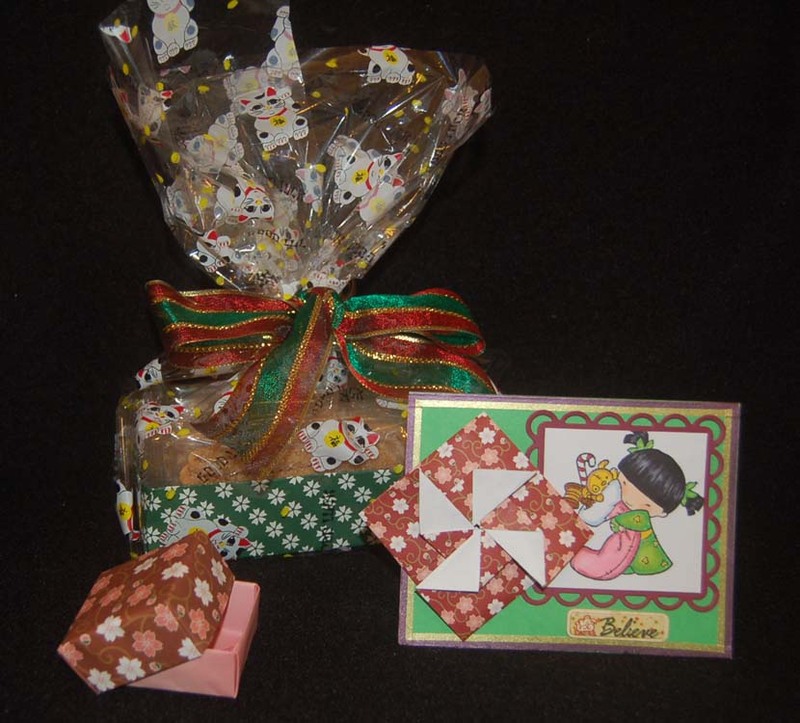 The little star and gingerbread man cookies are Darice buttons with the shanks cut off. The words were made with a Dandelion Design stamp. The little mouse staring at the cat is really a ring holder I found at Ben Franklin Crafts. Isn't it cute? For those of you still struggling to find the right last minute gift, I've got a great idea. 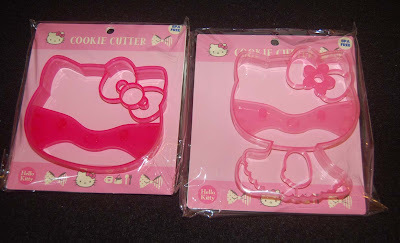 How about Hello Kitty cookie cutters? I found these adorable giant cookie cutters at my favorite store..... BFC of course! Any crafty cook and Hello Kitty fan would love to receive these with some pretty Wilton sprinkles. Okay, that's it for now.....go shop, wrap, or sit back and relax before the big day. Yup, I'm still making shaker tags, but I figured out a simple way to make them. I think this idea is mine, but I read so many blogs and magazines that it maybe a 'borrowed' idea. Anyway, I started with a small colored envelope which I carefully took apart. 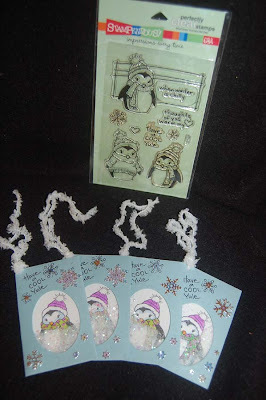 I used a Spellbinder oval die to cut a hole to accommodate the penguin stamp image ( Stampendous clear set). Next, I taped a piece of acetate behind the oval window and stamped the words on the outside corner of the envelope. After stamping and coloring the penguin on white card stock, I cut the card stock to fit in the re-assembled (with Merikan tape) envelope. 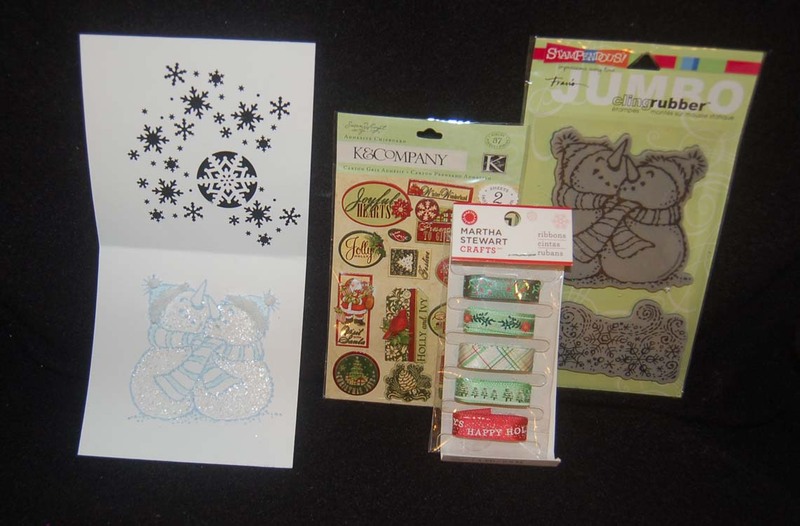 I added white Flower Soft and MS snow glitter between the acetate and penguin image before sealing up the envelope. I punched a hole in the envelope then added yarn ties and stickers. The back of the shaker envelope tag was covered with a scrap of printed card stock to make space for writing a message. You might want to suggest that the tag be recycled for next year's tag by covering up the writing on the back. 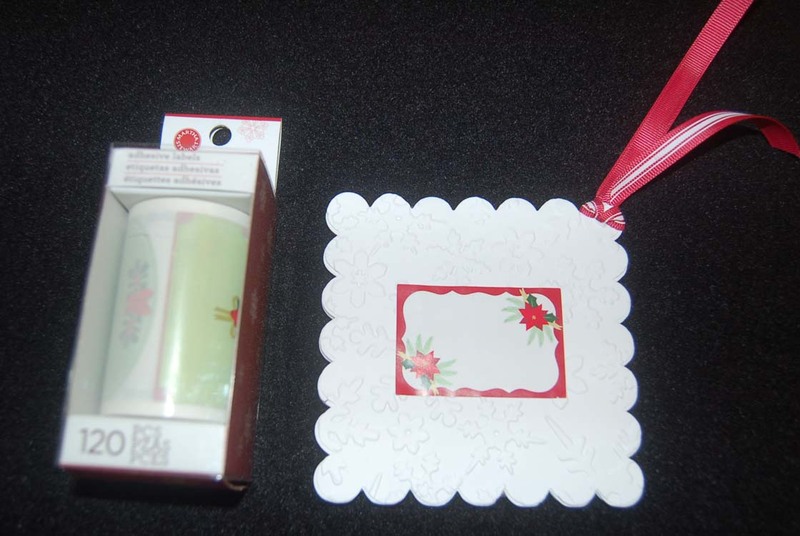 This type of shaker envelope can be easily applied onto a card for other occasions. Happy Holiday Crafting! Here are more envelope shaker tags made with a Stampendous elf stamp and gold mylar-like beads (Sierra Pacific). Thanks for visiting and come back soon! I really love the position-it-wherever feature of the Martha Stewart punch all over snowflake punches (available at Ben Franklin Crafts). 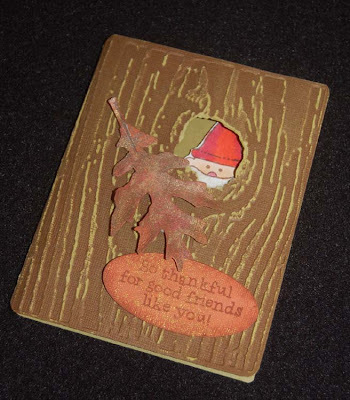 It allows me to create openings in cards that would be impossible with other punches. I used these punches to make the peek-a-boo feature on the front of this card. (Punch out the single snowflake first.) Inside the card I stamped and glittered the Stampendous snowpeople image using light blue Memento ink and watercolor pencils. I purposely made the image monochromatic and light so it would only hint at something behind the punched snowflakes. (Sorry, the photo is not clear of the image because I was trying to avoid the glare on the packages.) Martha Stewart Christmas print ribbon and a K & Co. adhesive cardstock sticker with foil highlights (two sheets of assorted stickers in the package) was used for the band around the card. (Hint: Dust the back of the tag sticker with cornstarch once you have it in place on the ribbon so that the adhesive backed sticker tag won't stick to the card and make the removal of the band and opening of the card difficult.) 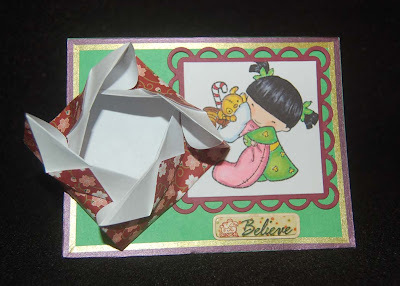 I hope this post has shown you how simple it is to create your own one-of-a-kind card. 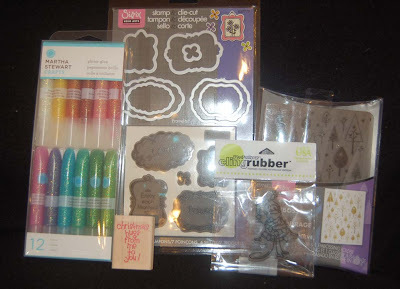 I'm glad you visited this blog today come back soon for more holiday craft ideas. Our friends from Japan often send us the most elegant, simple Christmas cards that make me wonder if they think our American cards are too gaudy. In a conscious effort to pare down on embellishments and yet retain beauty, I came up with this card to send to faraway friends this year. I started by experimenting with various embossing powders on colored washi (?) paper that contained little wispy fibers and gold/silver flakes. I found that the best combination was a powder that was mixture of opaque white and silver. 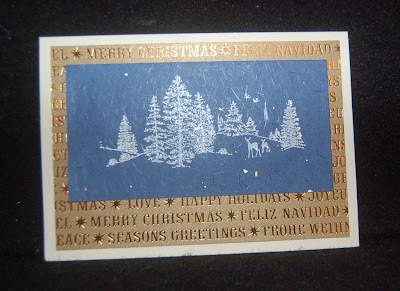 (Embossing is done by stamping an image with pigment ink because it stays wet on the surface of the paper long enough to sprinkle on the powder and heat it with a heat gun.) The mixture of the white and silver gave just the right look of glistening snow (sorry, hard to see this in the photo). 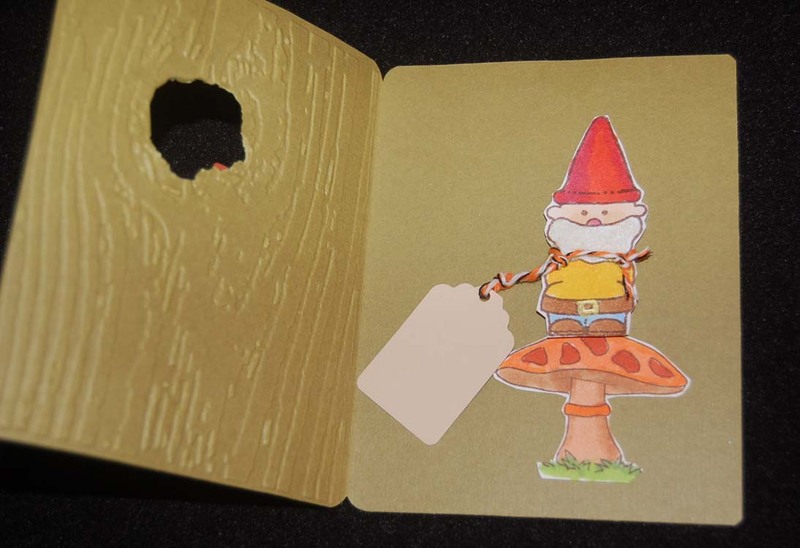 Next the embossed scene was taped (Merikan) to the piece of K and Co. foiled cardstock which was adhered to the white card. For those of you who have to have a little bling, you can add a glittered reindeer sticker (Jolie's) inside the card. A card like this is simple to make in multiples, but looks very professional (which is especially good for business related purposes). I hope your week is going well and you are getting all your holiday duties completed. Thanks for taking the time to stop by during this hectic season. Smile and craft a little to de-stress. Ah, my last Christmas package has been mailed out....still have the local gifts to wrap. I don't know why, but every year I procrastinate making and wrapping the right gifts for my sister. I usually find things for her all year and have a vague idea of what sure-to-please gift I can make for her, but I'm so indecisive that I keep changing my mind. 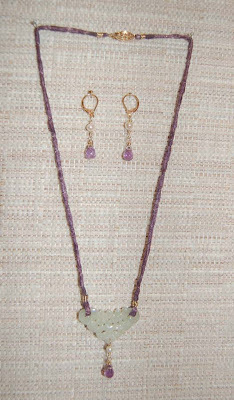 This year I was shopping for her until yesterday and only finished this necklace and earring set the night before. Sigh, but it just wouldn't do to not send her a handmade gift; she would be so disappointed. 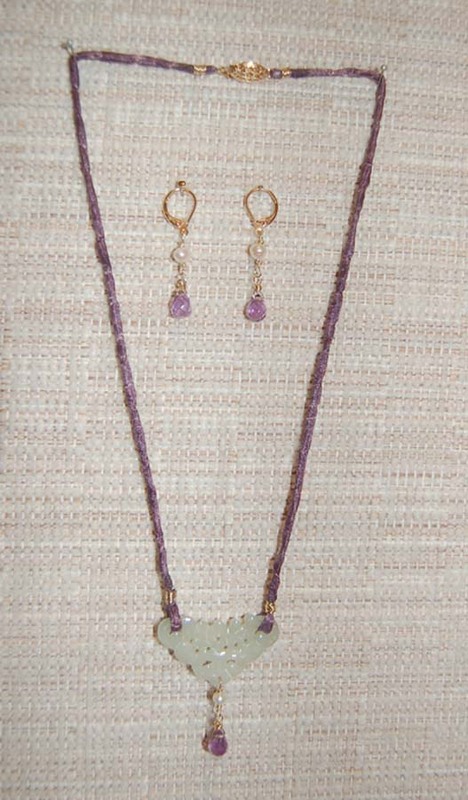 I hope she'll be pleased with this jade, pearl, amethyst, and silk jewelry. It was constructed with simple wire-wrapping techniques. The focal jade component was purchased in China but I've seen it (or similar ones) sold at Ben Franklin Crafts. The gold filled clasp and earring hooks are from BFC and I think the silk cord was purchased there as well. (Sorry that the photo is not too clear but I was understandably rushing 'cuz I still needed to wrap everything and mail it out too!) I'm so happy that a major part of my Christmas dilemma is solved and I just have a little baking and some wrapping to do. I hope that your Christmas rush-rush is almost done and if not, BREATHE and know that you can cope. Holiday Hugs! I thought that you might like to see a tag that I made using the mylar-like beads (Sierra Pacific) that I showed you in a previous post. 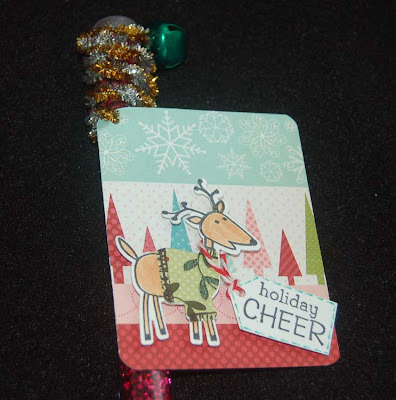 Rather than make a shaker card I used the beads to make a shaker tag. I started the tag by cutting two scalloped squares from white cardstock using a Sizzix die. Then I stamped the Hero Arts snowman image on one and the Inkadinkado snowglobe image on the other. 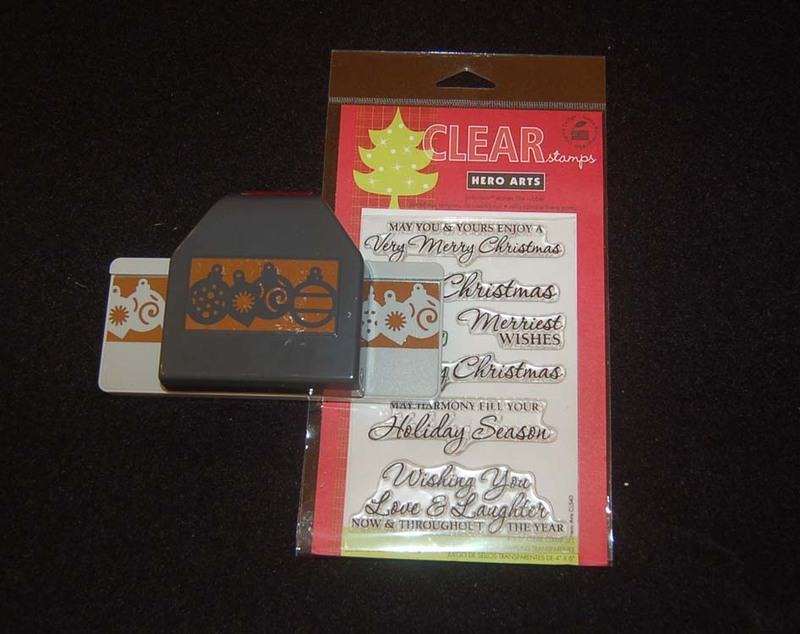 (You can probably easily draw a snowglobe if you can't find this rubber stamp.) Next I cut out the 'glass' part of the snowglobe leaving a small margin. A third scalloped square was cut from a self-adhesive white foam sheet I bought from Ben Franklin Crafts. The scalloped square with the snowglobe image was lined up with the foam square and the opening traced and cut out (a little bigger than the traced opening). Then I glued a piece of clear acetate behind the square with the stamped snowglobe image and adhered the whole thing to the cut out foam square. I colored the snowman image (adding glitter here and there, filled in the cavity with the beads and sealed the pieces together. 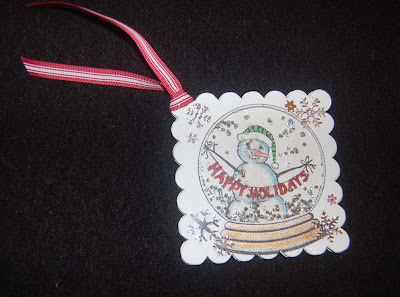 For embellishments I used Darice snowflake stickers and American Crafts peppermint ribbon. Because I used paper that was too porous, the markers bled through the back of the tag so I covered it with another scalloped square of paper that I embossed with the Sizzix snowflake embossing folder that comes in a set with a few other images. The back of the tag now looks prettier and more interesting but was a little lumpy to write on so I added a Martha Stewart label (120 in the box!) I bought from BFC. I am very happy with how this tag turned out, but I might layer two pieces of adhesive foam next time to make more room for the beads to shake around in or use a thicker foam piece. I hope that you'll take the time to make a pretty tag for those special gifts. I often use a fancy tag in place of a bow (especially for mailed gifts) and suggest that the recipient recycle the tag by using it on a card next year. Thanks for reading this rather long-story post. I'll be back soon with another Christmas idea. Holiday Hugs! I don't mail out as many Christmas cards as I did in previous years, but I still like to make fancy tags. When I discovered these two Christmas Sizzix dies at Ben Franklin Crafts, I knew they would make fantastic tags because of their fancy shapes. 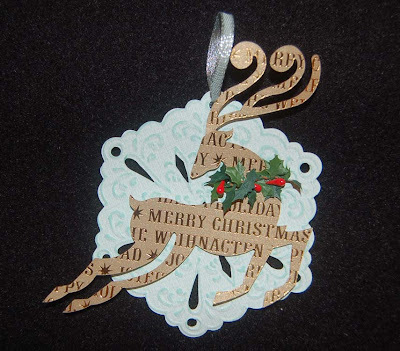 The reindeer was cut from a K and Co. paper which had a warm golden color and foil words. It was adhered to the snowflake die cut with an artificial holly sprig (sold in a roll). 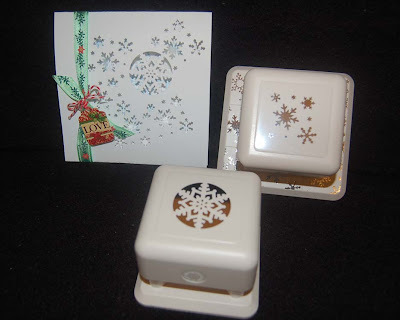 The snowflake was cut from whitewashed cardstock which was embossed (using the folder which came with the Sizzix die) and lightly sanded to reveal the pretty pattern. Because the snowflake has cut out holes, the holly sprig and tag hanging ribbon (Martha Stewart) were easily attached. 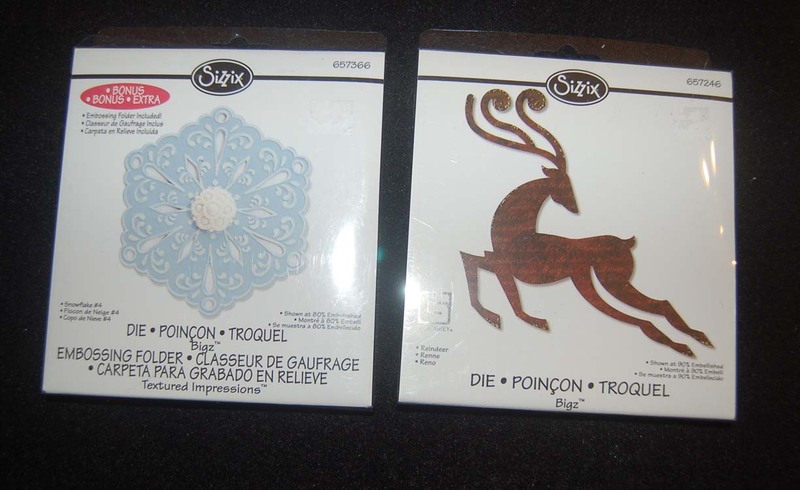 Although the reindeer can mostly be used for holiday decorations, the snowflake is very adaptable for other occasions because it looks like a hexagonal doily. 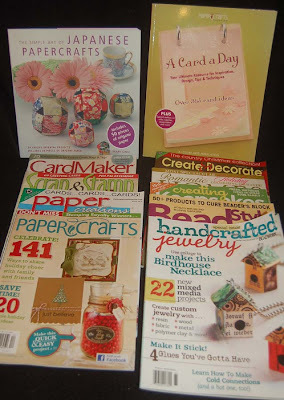 Have a crafty weekend! As soon as I spotted the new Bird #2 Sizzix die with matching embossing folder, I knew it would make the perfect Xmas card or tag. I always love the look of those fancy die-cut cards that are embossed and boxed in sets. With this die set I can now make dozens of cards for almost nothing. First, I cut the card from plain white card stock. By placing the fold of the card just outside of the tail of the bird, the card is cut to shape but opens like a regular card. Next, I cut out a single bird and embossed it in the folder. 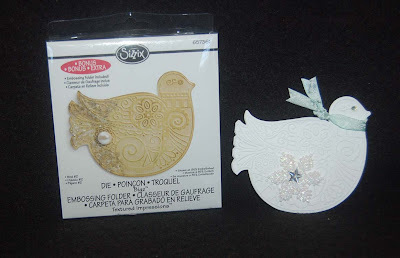 This embossed bird was taped (with Merikan double stick) to the front of the card. 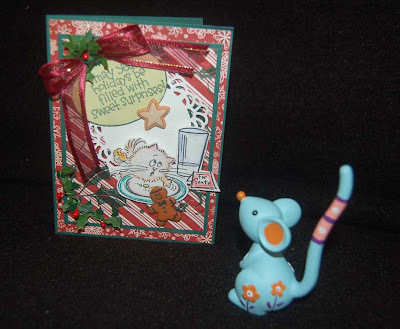 The inside of the card was stamped with words and image from Scrappy Cat Christmas Clear Stamps. A Martha Stewart snowflake ribbon was tied around the neck of the bird and a snowflake ornament was glued onto the front of the card. The card was further embellished with an acrylic jewel eye and sparkling acrylic star. This snowbird card was kept simple on purpose, but you could dress it up with fancy Xmas artificial sprigs and or lightly color the embossed surface. 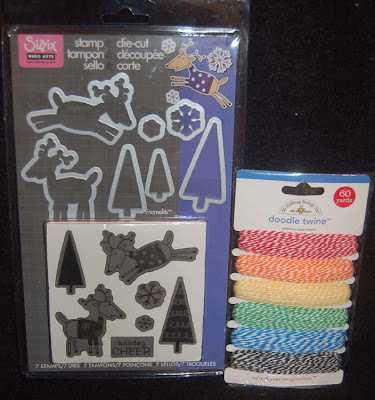 I bought this product because I felt that not only was it an easy way to make something simple look fancy, but it can be used all year round simply by changing the embellishments. Can't you just see it on a spring card decorated with flowers and gauzy ribbons? I'm sure any paper crafter will be thrilled to receive this die (or choose from many others with embossing folders) for Christmas. Give one and buy one for yourself in the spirit of crafty giving! Here's a no-brainer Hello Kitty project that will simplify your gift list. 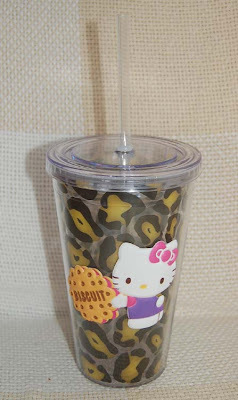 Start with one insulated cup (straw included) and a puffy, plastic Hello Kitty sticker. Spread glue (I used 527) almost to the edges of the sticky side of the sticker. Place sticker (with glue) on cup where desired and hold momentarily. The unglued edges will hold the sticker in place until the glue sets. Voila! You have an instant gift which can be filled with candies, arare, cookies, hot chocolate mix (BFC has lots of delicious mixes), or crafting supplies. Your friend, co-worker, teacher, or coach will love this simple gift. Ben Franklin Crafts has a good variety of printed insulated cups so you can have fun creating somethng unique in just a few minutes. Happy Holiday Crafting! 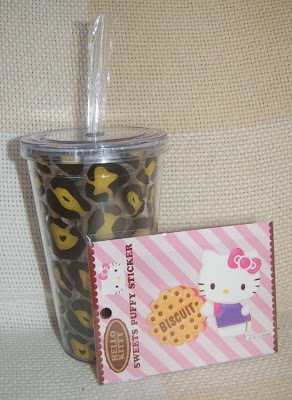 When you start running out of time or gift ideas for a Hello Kitty fan, try this simple idea. 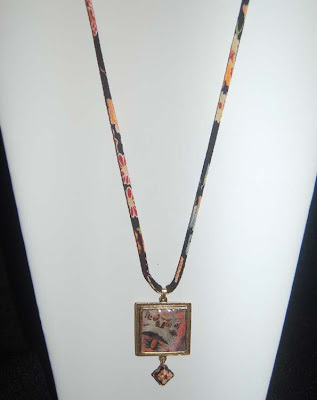 Purchase a ball chain (in a color to match the charm) from Ben Franklin Crafts and attach a HK charm. 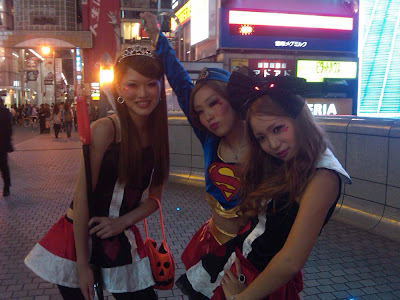 The one on the left had a lobster claw already so all I did was clip it on. 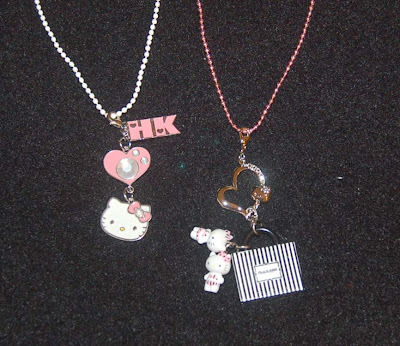 The necklace on the right (sorry the photo show a pinkish hue on the metal parts but they're really silver colored) has an open heart HK charm to which I attached a jump ring. The charm (from a vending machine) was then connected to the jump ring. I think these necklaces would be suitable for a young girl or grown-up Hello Kitty lover. Hope you like this quick gift idea and that it helps to resolve some of your gift-giving stress. Enjoy the season! This last Hello Kitty quick idea is great for those of you who don't have gift wrapping skills because the wrapping is the gift! 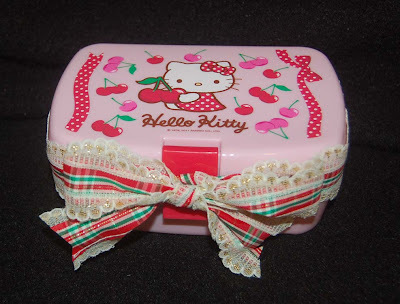 Start with a Hello Kitty bento (lunch) box; Ben Franklin Crafts has many with appropriate Christmas colors. Fill the box with crafting supplies and/or edible goodies and tie it with a fancy ribbon......you're done! 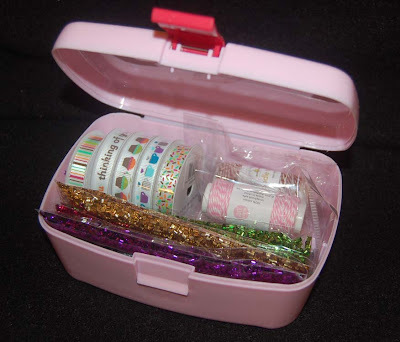 I filled my Hello Kitty box with American Crafts ribbons, Doodlebug Design twine and cellophane candy bags filled with the little mylar-like beads from Sierra Pacific. The cost of the entire gift was under $20. I really like the fact that the recipient of this gift can use the box and I didn't have to fuss about the wrapping. 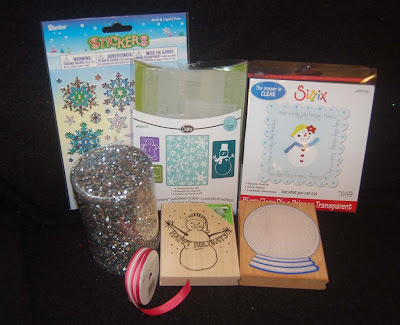 Hope you liked these three ideas and that they have helped you with your gift list. Happy shopping and giving! 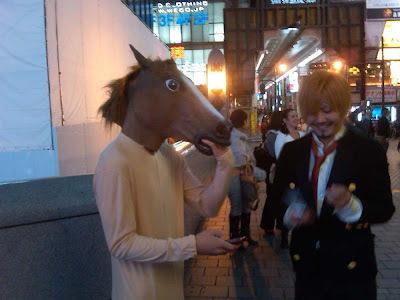 Secret Blog Comment Contest Winner! I bet you're surprised that I'm having yet another contest. This one was a surprise one where I chose a name from all the comments sent to my blog in the month of November. If you sent in 10 comments your name was in the comment bag 10 times and even if you sent in only one comment in Nov. you had one chance to win. This time the winner is Annette and I've already sent her an e-mail to get her mailing address. Congratulations Annette and thank you to all who read my blog and take the time to send in a comment. 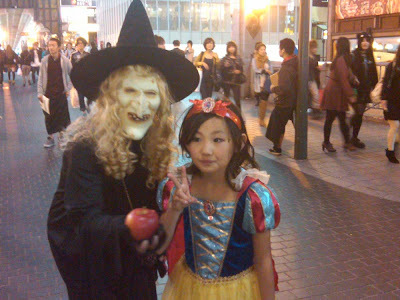 I hope you continue to be a reader of Lynn's Blog and will continue to send me your comments. They are always so encouraging and you never know when I will have another secret comment contest. Oh, Annette will be receiving a $35 gift card to Ben Franklin Crafts for being such a loyal reader and sweet commenter. Do you have a collection of those extra large take-out plastic drink cups? I just can't bear to throw them out because the plastic is the thick, strong kind that I intend to make into planters.... someday. 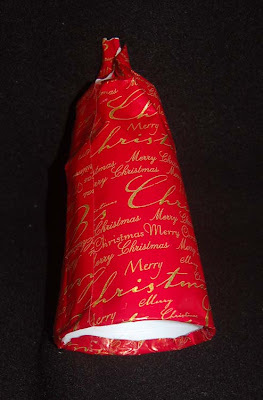 Awhile ago I was looking at an upside-down empty cup and I imagined it as a Christmas tree. My husband thought it was another ploy to hoard more 'to-be-recycled' stuff. 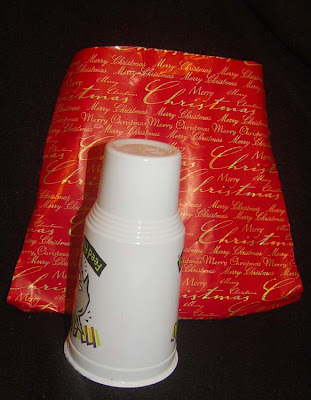 Well, here's a step-by-step of how I recycled a plastic drink cup into a Christmas tree treat holder. (My husband is no longer skeptical about my intent to recycle.) 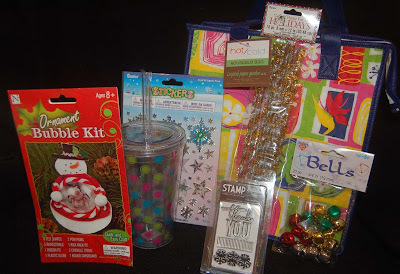 I started with the cup (one with a small bottom that is designed to fit in the car cup holder) and some used Xmas wrapping paper (yes, I saved some from last year). I taped the paper onto the cup without being concerned about neatness (patch where necessary because it won't show). Scrunch the top of the wrapping paper into a wrinkled cone shape. Next, glue (I used Fabri-Tac) the tinsel around the papered cup. The tinsel garland in the photo has wire in it so it is easy to form it around the cup. Glue on the plastic star. 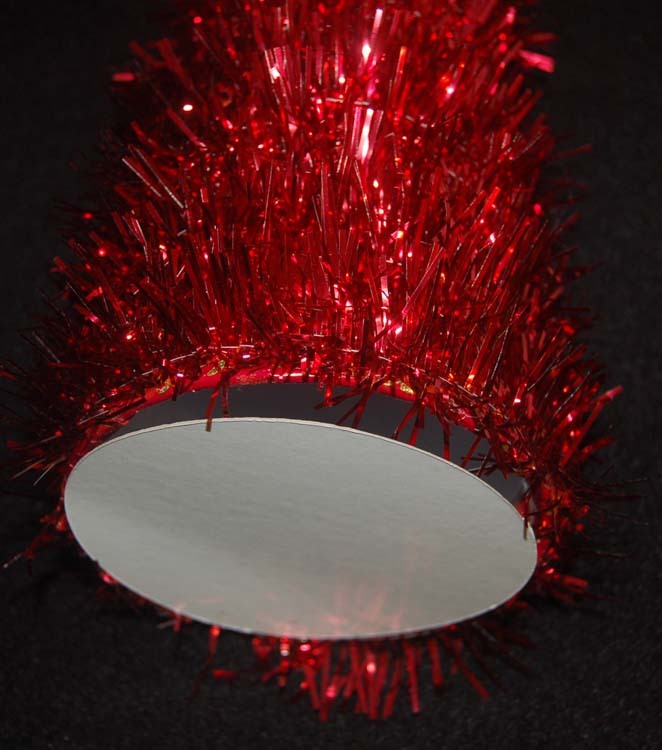 After filling the finished tree with treats, glue down a bottom made from recycled cardboard which was cut into a circle (use the cup bottom to trace the size). The finished tree makes a lovely table decoration and filled with homemade treats it will be the perfect teacher, coach, or co-worker gift. 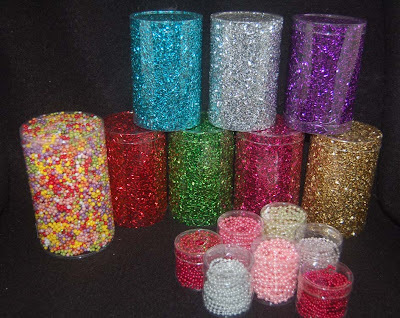 (Bag your treats before sealing them in the cup as it probably isn't airtight.) 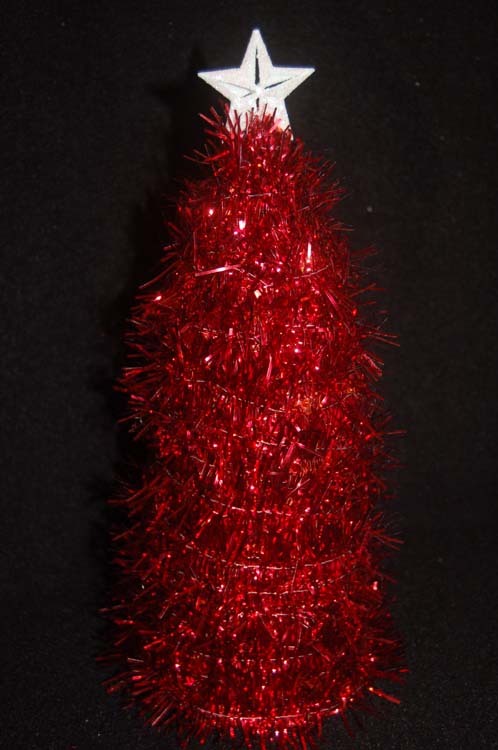 I think I will try to find a larger tree topper as I think the star is a little small for the size of the tree. Ben Franklin Crafts has many colors of the wired tinsel and they are very reasonably priced. One roll will make one tree with some leftover. Making a treat holder like this takes very little time and expense; it is a good way to recycle what you would normally throw away. I hope that you will try this gift idea as a present to a friend and the environment. Happy Recycled Crafting! Hooray! eLi submitted the right total of $22.93! I will be sending you the gift card as soon as I receive your mailing address. 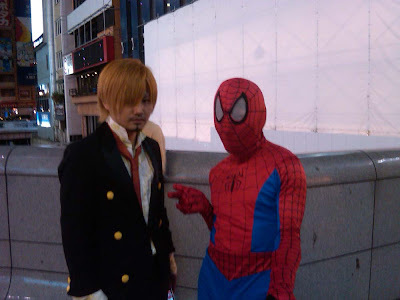 I noticed that you just opened a blogger account today and there is no information about you or your blog so I don't know how to get in contact with you. Please send your address to lsakami@aol.com. Congratulations for being so clever.